I originally posted this recipe in September of last year. You can find the original post here. I made this again last night and it was delicious! I still didn’t take my own picture though. The original recipe inspiration came from www.myrecipes.com and can be found HERE. I adapted the recipe a bit to suit my style. When I originally made this recipe I used fresh everything. But last night I did a little “shopping” from my freezer! I totally love being able to head out to my freezer to go produce shopping from my garden harvest in the middle of December. So awesome! I used about 6 or 7 small/medium size poblano peppers that we had roasted and then frozen this summer. I didn’t peel them before we froze them which turned out to be okay because once they defrosted a bit the skins peeled off super easy! WAY easier than when they are freshly roasted. I also used 3 cups of corn that I cut off the cob this summer and froze. That fresh, sweet corn flavor was perfectly preserved and gave the chowder super flavor. I have made some minor alterations to this recipe based on having made it a couple more times. The recipe below includes these alterations. The original recipe is delicious, but these adjustments give it a bit more oomph. 1. (If using fresh) Roast poblano peppers in the oven or on a hot grill until they are charred well on all sides. Place in plastic zip top bag and let steam for 15 minutes to make removing the skin easier. Remove the skin, top and seeds of the poblanos. (If using frozen, defrost, skin and dice). 3. Add olive oil to medium hot skillet. Add onions and garlic. Saute until onions are soft; add the diced poblanos and saute 2-3 minutes more to heat thorough. 4. Add 1 cup corn to pan and sauté/pan roast for 3-4 more minutes or until corn starts to soften and brown slightly. 5. Add 1 cup of milk to pan. Heat mixture to simmer; continue to simmer for 10 minutes stirring occasionally. 6. Take the remaining 1 cup of milk and 2 cups of corn and puree in a blender until smooth. 7. Add to corn and pepper mixture, along with butter and half and half. Stir to combine and heat through. Sprinkle with generous amount of salt and fresh cracked black pepper. 8. Ladle into bowls and top with 1 tablespoon of grated cheddar per bowl. Garnish with blue corn chips or tortillas. 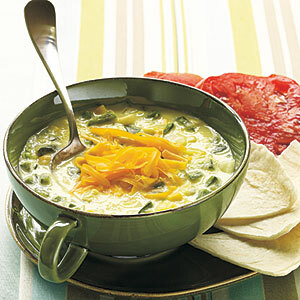 This entry was posted on December 17, 2011 by Corrie Beebe in cooking, food, recipes.